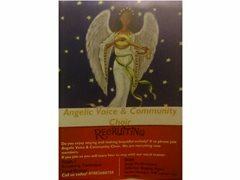 Angelic Voice and Community Choir is looking for instrumentalist to join our charitable choir. We are looking for drummers, keyboardist, bass player, trumpet player and more to join us. We are looking for creative musicians that are able to play by ear and also able to read music sheet. If this sounds like you please join us. Angelic Voice and Community Choir is a gospel and charitable choir. We perform for different charity events. Rehearsals are taking place this Saturday 24th of November 2018 in north London. Someone that can play by ear and also able to read music sheet. We are looking for someone who is able to play by ear and also able to read music sheet.